Akehurst’s Modern Introduction to International Law continues to offer a concise and accessible overview of the concepts, themes and issues central to international law. This fully updated eighth edition encompasses the plethora of recent developments and updates in the field, and includes new dedicated chapters on international human rights, self-determination and international economic relations, an extended history and theory section reflecting the evolution of new and critical approaches in the field and a greater focus on terrorism and international criminal law. Orakhelashvili has done a tremendous job in updating a seminal textbook on international law. Clear, concise and comprehensive yet accessible, Akehurst’s Modern Introduction to International Law continues to be of great appeal both to newcomers to the field of international law and those well versed in the subject. 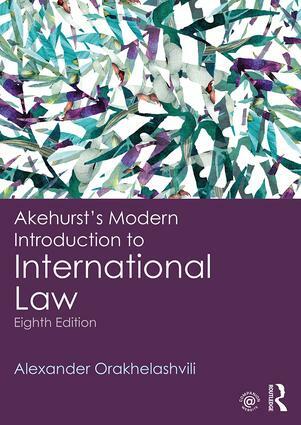 For many years, Akehurst’s textbook was the standard for law and politics students studying public international law. This new edition, ably updated by Alexander Orakhelashvili, includes key advances in international law, for example, the Kosovo Decision and the evolving law on the right to self-determination, the explosion in international criminal tribunals, the growth of international environmental law and the increased relevance of arbitral tribunals. All of which is to be much applauded. Alexander Orakhelashvili, LLM (Leiden), PhD (Cantab.) is a Senior Lecturer at the law school of the University of Birmingham. His research covers all areas of international law. He has written and edited several books on international law, as well as a number of articles and chapters in leading journals and edited collections.